As far as fishing stories go, we’ve all heard about the one that got away. In development circles, there’s the proverb about giving a man a fish versus teaching a man to fish. You know the cliché. It’s a fine line between whether the poor fisherman will eat for a day or for a lifetime. Don’t worry. This is neither. Rather, this is about the one that’s almost gone — and about grassroots efforts in Brazil to prevent the loss of livelihoods along with the species. The pirarucu (Arapaima gigas), native to the Amazon and Essequibo basins of South America, is sought after because of its tasty white meat — and talk about feeding for a lifetime, a good size fish can yield 110 kilos (about 242 pounds) of meat. Because it’s a prize catch, the pirarucu is largely over-fished. In Brazil, an Inter-American Foundation (IAF) grantee partner is using a challenging but unique way to try and manage stocks of the pirarucu and ensure not only that the species survives, but to continue to be a source of food and income for the communities that depend on it. The Cooperativa de Trabalho, Prestação de Serviços, Assistência Técnica e Extensão Rural (COOPTER) supports communities in Araguacema and Couto de Magalhães in the state of Tocantins to establish cooperation agreements and associations for managing fishing in the lakes along the Araguaia River. Fishing agreements and management plans are still a novelty in Brazil, although legislation provides for them. Agreements and plans bring together fishers, property owners, and municipal, state and federal governments to encourage more sustainable fishing in the region. I went to Brazil to visit COOPTER in the beginning of December. Although I didn’t encounter this huge creature, I did learn more about grassroots efforts to save it. There are many names for the pirarucu. In Peru, it is known as paiche. 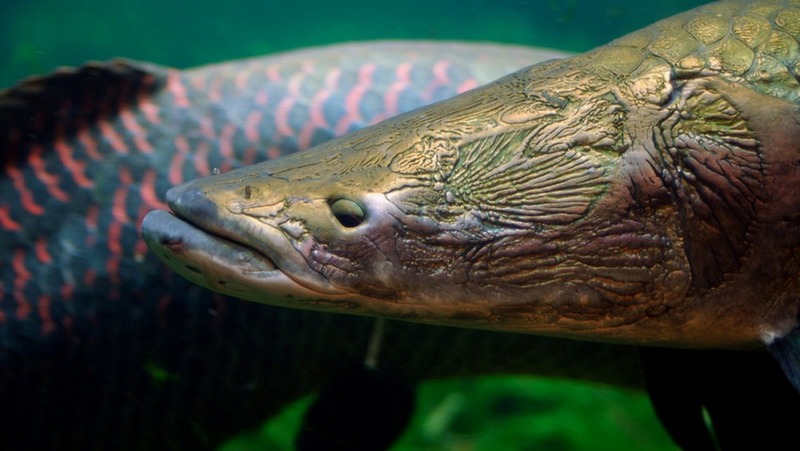 The scientific name Arapaima came for an erroneous understanding of warapaimo, from the the Macuxi indigenous people from Roraima in northeastern Brazil bordering Venezuela. In their language, warak means “fish”, and paimo means “very big.” In Tocantins, the indigenous language of the Kraho who still populate areas to the south of Araguacema and Couto, comes the word pirarucu. In their language pira means fish, and urucu or red, as it usually has red stripes. No matter what it’s called, the pirarucu is truly the stuff of legends. It can grow to about 2.75 meters (almost 9 feet) long and is considered a living fossil, not having changed much compared to its ancestors from the Miocene epoch five million years ago. The Arapaima has also been featured on Animal Planet’s “River Monsters” television show, where host Jeremy Wade — a biologist and “extreme angler” — is shown battling one of the “Amazon Assassins” hooked on his reel. Fisherman Alonso Pereira Martins, a member of Acordos de Pesca Araguacema e Couto de Magalhães, said that the fish will become just a legend if something isn’t done to manage it. It doesn’t help that it can be an easy fish to net — largely due to one of the more peculiar aspects of this whopper of an animal. The pirarucu breaths air through a primitive “lung” that can absorb oxygen from air and water. It comes up to the surface frequently and can be spotted when it takes in big gulps of air before disappearing again deep below. In a way, this could also help the fish. COOPTER is training its members to spot the breathing intervals in order to count how many are in a given area. This gives the fishermen an idea on population size, which becomes especially important during spawning season, when the government declares an annual ban on fishing. The fishing cooperative members use their knowledge of population sizes to map out where the fish are to monitor and protect them further, or even suggest whether some can be dispersed to stock depleted waters. I was eager to see one of these creatures in their natural habitat. Unfortunately my trip coincided with the rainy season — the pirarucu’s prime spawning season. This is when it moves out of the river toward instinctual breeding pools or lakes created by the high waters, where a female can deposit as much as 180,000 eggs. Instead of disappointment, I admired the association’s steadfast loyalty to honoring their agreements and not disturbing the pirarucu in this critical time. By giving the fish time to recover, the association can better manage the stocks and ensure their livelihoods and traditions. Visiting one of those lakes in Araguacema, the fishermen explained how they are building floating platforms where they will pull shifts in monitoring the waters to report illegal fishers. Strengthening ties with authorities through the years has given more consequences to violators. For example, one man who was recently caught had his boat and fishing gear confiscated. In another community, Porto Franco, a district of Couto de Magalhaes, a group of 40 fishers explained how they have rarely seen the pirarucu in the past two years. It has been so overfished that it is almost non-existent in the area. COOPTER members discussed how it may be possible to bring some fish from the lakes in Araguacema to repopulate waters of Couto, but only after similar surveillance bases are set in place. Going back to the old proverb, it seems somewhat condescending to suggest that outsiders can teach locals how to do something better, like fishing. In this case this association is showing how local knowledge and experience is key to achieving true sustainability. The establishment of the fishing agreements — and their recognition by the state government as legitimate accords among farmers, fishers, municipalities, environmental agencies and other authorities — is a tremendous feat. Combined with the surveillance efforts, the pirarucu is sure to see a comeback, saving not only a species, but livelihoods. It is precisely these types of grassroots efforts that the IAF is best suited to support.